Liquid sampling solution for SP76 (NeSSI) Modular Substrates. The Mechatest SP76 (NeSSI) Liquid Sampler is designed to take liquid samples, manual or automatic, directly onto the Modular Substrate NeSSi - ANSI/ISA 76.00.02 base compliant substrate or platform. 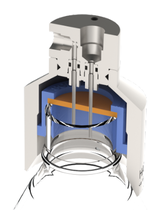 NeSSI the New Sampling Sensor Initiatives is the state-of-the-art and next-generation modular liquid sampling system designs for process analytical applications. The miniaturization result in maintaining productivity and quality while achieving drastic reductions in resource and waste generation. The Mechatest NeSSI sampler features a body with three port configuration. 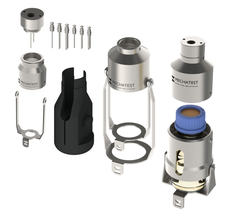 We designed two versions; Version 1 provide sample inlet, bypass and vent connection and version 2 is more regular for straight line flow thru for sample inlet/outlet and a vent connection in the middle. On the bottom you place the Mechatest modular “needle sampler”. On the top you can place any valve control device, both connections also based on the ANSI/ISA 76.00.02 – 38.2 mm small footprint. Worldwide unique based on SP76 Modular Substrate! NeSSI (New Sampling/Sensor Initiative) is a global initiative intended to simplify the assembly and reduce the overall costs connected with the design, engineering, installing, and servicing of process analytical systems. Sponsored by the Center for Process Analytical Technology (CPAC) at the University of Washington. 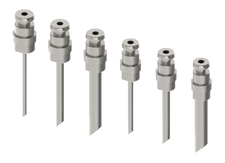 NeSSi promotes the acceptance and implementation of modular, miniature sample system technology and components using the mechanical design based on the ANSI/ISA SP76.00.02-2002 standard. Mechatest offers liquid samplers housings conform to SP76 standards. 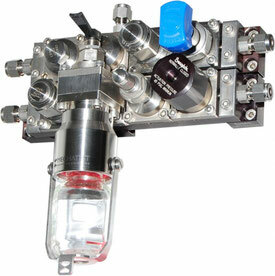 All our housings are designed to have a minimal internal volume to increase the response time and minimize lag time. 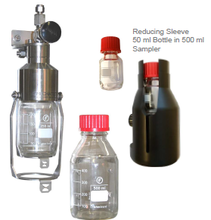 The modular design in combination with our ECO sampler parts has a lot of advantages, can be used with independent sample and vent suitable on all kind of liquid sampling applications. The Mechatest Sampling Systems are widely used and accepted among the leaders in the chemical, petrochemical, pharmaceutical and energy industries.